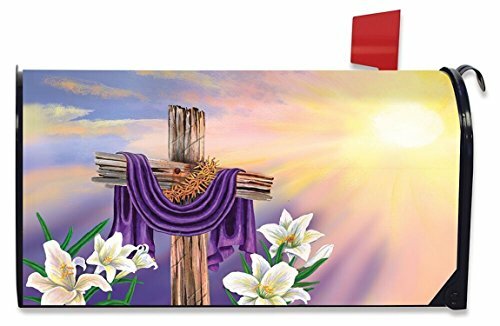 Easter Cross magnetic mailbox cover focuses on the cross draped in purple cloth, with lilies at the foot as the sun rises/sets. Printed on all-weather vinyl material. Made to fit standard size steel mailboxes measuring 6.5" x 19". Easily attaches to your mailbox with the magnetic strips and includes 3 sets of adhesive numbers.